I've been spotlighting some of the new Christmas books this year and while I still have a few reviews to come, here are a few more you might enjoy picking up. 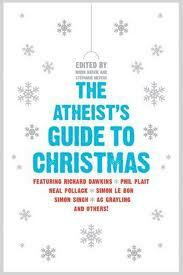 About the Book: What do you get an atheist for Christmas? Richard Dawkins tells an original Christmas story. Phil Plait fact-checks the Star of Bethlehem. Neal Pollack teaches his family a lesson on holiday spirit. Simon Singh offers a very special scientific experiment. Simon le Bon loses his faith (but keeps church music). AC Grayling explains how to have a truly happy Christmas. Plus thirty-six other brilliant, funny, free-thinking pieces perfect for anyone who doesn't think of holidays as holy days. About the Revelation of the Magi: Each Christmas, adults and children alike delight at the story of the kings from the East who followed the star to Bethlehem to offer gifts to the newborn Christ. While this familiar tale is recorded in the Gospel of Matthew, another little-known version later emerged that claimed to be the eyewitness account of the wise men. This ancient manuscript has lain hidden for centuries in the vaults of the Vatican Library, but through the determined persistence of a young scholar, Brent Landau, this astonishing discovery has been translated into English for the very first time as the Revelation of the Magi. Everything we know about the wise men is based on only a few verses from the Bible. With the Revelation of the Magi, we can now read the story from the Magi's perspective. Readers will learn of the Magi's prophecies of God's incarnation from the beginning of time, their startling visitation in the form of a star, the teachings they receive from the baby Jesus, and the wise men's joyous return to their homeland to spread the good news. This ancient version of the Christmas story is guaranteed to astonish and delight. It will also raise larger questions of the significance and meaning of Christ's birth, and the mission to spread the good news to every corner of the globe. All the drama and intrigue of the brief description of Jesus's birth in the Bible is filled out in greater, more colorful detail, offering for the first time the complete story of these beloved characters. Another one I hoped to get to before Christmas, I still might! Seems like a really interesting topic. Available now from HarperOne. 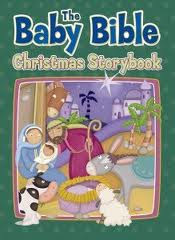 this series, The Baby Bible Christmas Storybook, makes the birth of Jesus relevant for very young children through the use of colorful pictures, basic prayer and worship, and fun physical activities. It is never too early to introduce the truth of God’s Word to children, and the Christmas Storybook will enhance a child’s earliest experience of this very special family celebration. About the Book: You know these songs by heart. They're the 'greatest hits' of Christmas. But do you know the fascinating, inspirational stories behind them---who wrote them and how they came to be? In his latest book, Ace Collins reveals the stories behind the greatest hits of Christmas---all the songs you have enjoyed for generations. For example, as the story goes, jazz great Mel Torme wrote 'The Christmas Song' after visiting a friend in California, who, longing to escape California's heat for the cold winters of his New England, doodled these now-famous phrases on his spiral pad: 'Chestnuts roasting ... Jack Frost nipping ... Yuletide carols ...' Torme saw those words and one of the most famous Christmas songs of all time, first recorded by Nat King Cole, was born. Within these pages, you'll discover the origins of such famous Christmas songs as 'Have Yourself a Merry Little Christmas,' 'Winter Wonderland,' 'White Christmas,' 'Little Drummer Boy,' 'Feliz Navidad,' 'O Holy Night,' and two dozen others. Although not yet as famous as the Christmas songs of which he writes (he's working on that), Collins's many books have sold tens of thousands of copies and have become treasured family classics, read and enjoyed by young and old alike. His new book is a treasure-trove of the kind of magic that makes Christmas the beloved holiday it is. 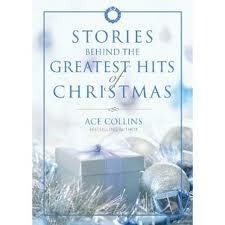 This is Ace Collins at his storytelling best ... which means it's sure to become a 'greatest hit' with your family, too. Available now from Zondervan. About the Book: Ho, ho, huh?Who’s that excessively jolly fellow with the fake beard, shifty eyes, sweaty hands, and boozy breath? 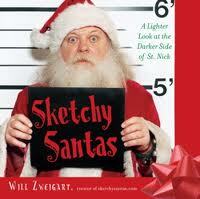 Why, it’s not just Santa but sketchy Santa! Yes, ’tis the season for awkward photos of small children posed precariously on the laps of some of the most clownish, irritable, and just plain weird-looking Santa wannabes—guys you’d give a wide berth to if you passed them on the street. Other posts in this series: Christmas novellas for 2010, Christmas Mysteries, Christmas Amish Books, Christmas Romance Books. I hope you've found some great Christmas books to read this year!